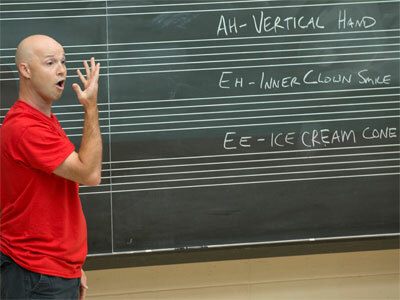 Jeremy Little demonstrates the motions he connects to vowel sounds. Jeremy Little, director of choirs at Vernon Hills High School, steps to the front of the spacious rehearsal room. Class is beginning, but it’s not time to sing yet. First, Little talks to his students about vowel sounds and their corresponding motions. “EH,” for example, pairs with “inner clown smile.” The “EE” sound? Ice cream cone. 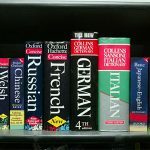 “OH” and “OO” sounds? “Circle finger” and “straw,” respectively. His students then vocalize the vowels, starting on the fifth of the chord and descending the major scale, moving their hands and arms as instructed. And those Ghirardelli chocolates Little distributed a few moments ago, with a caveat of not to eat them? They remain on the black metal music stands, mysteriously tantalizing the students – none of whom is a teenager. Taught by 14 master music teachers (all subjects, all levels) from the IL-CMP Committee, the workshop encourages and explains a different way of instruction. Teaching with intention, its T-shirts proclaim, begets performing with understanding. Put simply, the CMP model believes that student-musicians will deliver much-richer performances when they comprehend why and how the music placed before them was written and how those pieces of music connect with other works and their own lives. “We’ve come together as a group of teachers that have really a like-minded philosophy,” says Mary Lynn Doherty, associate professor and coordinator of music education in the NIU School of Music. But that “is only a piece of what we want to do in the classroom,” adds Doherty, a founding member of the IL-CMP Committee. Participants at the workshop, held the week of July 6, included a first-year teacher and a 36-year veteran with two semesters left before retirement. All came with one goal, says Little, president of IL-CMP. Although the sign on the door clearly indicates Room 171 of the NIU Music Building, Little’s lesson takes place inside the walls of Vernon Hills High School. He makes jokes about tornado drills and pep assemblies that are shortening the class that day. IL-CMP workshop participants sing vowel sounds with corresponding motions. And there is singing, beautiful passages from Jan Pieterzoon Sweelinck’s “Hodie Christus Natus Est” that coax stunningly gorgeous vocals from an unrehearsed group that also includes instrumental band and orchestra teachers. But Little’s creative approach transports his lesson from lecture to demonstration. This isn’t dry theory; this is exactly how he does it. Instead of recommending the use of small mirrors so choir students can watch themselves sing, Little leads the workshoppers through that very exercise. Later, the “students” count off into two groups like teams in P.E. class; now the “ones” can sing while the “twos” listen, and vice versa. To quickly test whether the class understood his lesson on the musical “textures” of monophony, polyphony and homophony, he plays CDs and tells students to hold up color-coded cards when they hear the corresponding textures. 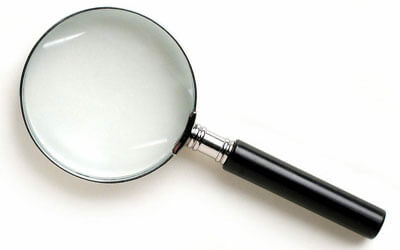 Developed nearly 45 years ago in Wisconsin, the Comprehensive Musicianship through Performance model urges teachers to select and analyze high-quality music for their students. It also demands that teachers determine desired outcomes, create strategies to achieve those goals and conduct assessment afterward. 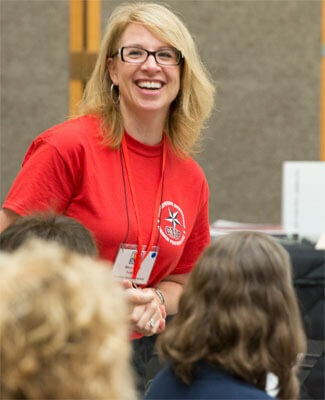 “We’re at this point in music education where we need to be more accountable for what our students learn in class,” says Margaret Jenks, a leader of the Wisconsin-CMP group who attended the first two days of the workshop at NIU. 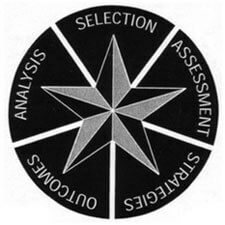 As educators are “bombarded by initiatives” that turn the direction of teaching every few years and then fade away, Jenks credits the model’s flexibility and roots in “best practice” for its endurance. While “no one of us is a perfect example of this teaching model,” she adds, it has proven to engage students and to energize teachers and shield them from burnout. Some who learn the CMP model will undergo “an instant shift, like a seismic shift,” Little says, while others will travel a gradual road of change. 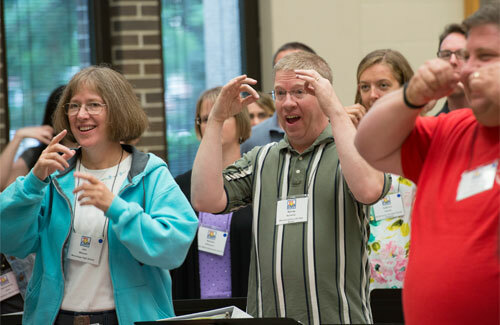 Eighty music teachers attend the IL-CMP workshop in the NIU Music Building. CMP teachers are motivated, Doherty says, and motivational. Proof? 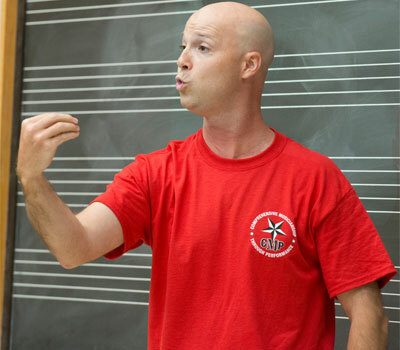 Drayton Eggleson, choral director at Sycamore High School, has attended the CMP workshop twice. Matt Temple raises his arms and, with a wave of his baton, begins to conduct a piece of music with its title and the name of its composer removed from the page. The director of bands at New Trier High School wants his freshmen – well, make that the CMP workshop participants – to ponder “the storyline” of the music from its sound alone. Temple’s lesson goes beyond the discussion on Standridge’s compositional intent. He also assigns students to write and perform their own exotic scales, and plays bits of rock songs by the Black Eyed Peas, the Cure, Led Zeppelin and the Offspring that employ similar scales. Jeremy Little is all smiles in the back of Room 171. Students, of course, are the prime focus of the CMP model. “The CMP model really encourages a lot of deep reflection and engagement on the part of the kids to join in the music decision-making process,” Doherty says. “Music is another language, and sometimes when kids haven’t been exposed to it, they don’t always feel it’s accessible. This model really makes it accessible and also just very participatory on the part of the kids,” Doherty says. “Besides just playing and singing, they’re being asked to analyze the music and discover compositional techniques and interpret what might be the different layers of meaning in the music,” she adds. Little provided them, and quickly banned them, to build anticipation. 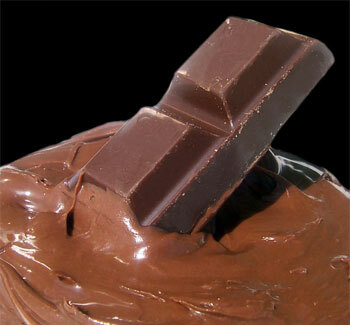 Eventually, the musicians were asked to think about chocolate, about what awaited their taste buds within the foil. Then they were allowed to unwrap the chocolates, sniff them and, finally, nibble away. The exercise illustrated how some composers structure the “tension” in their works – setting the stage, whispering musical hints of what’s to come, delaying the satisfaction and, at last, delivering the goods. During the debriefing after the lesson, when Jenks asked the workshop participants to discuss what they’d just experienced, she described Little’s chocolates as “props” to support his multiple teaching strategies. Members of the IL-CMP committee chose NIU as the site of their workshop because of its prime location and outstanding facilities. Several university units, including the School of Music, Outreach Conference Services and Housing and Dining, collaborated to ensure a successful event – the first of its kind for the school housed inside the College of Visual and Performing Arts. For the workshoppers, coming to NIU meant more than giving up a week of summer: The teachers were working in the Music Building classrooms from 8:30 a.m. to 9 p.m. each of the four days. But the rewards of “learning by doing” – and there’s another opportunity next summer from July 18 through July 22 – extend beyond the transformation of their teaching. The practical, of course, are the professional development hours. On the less-tangible side of the ledger are the accommodations – most stayed in the nearby and recently renovated Gilbert Hall – and the Wednesday night reception featuring the music of the Patische Steel Ensemble and its lineup of current and former students of NIU’s steel pan program. Greatest of all, though, is the camaraderie. The participants are “some of the finest music teachers in the state,” Doherty says. Sycamore’s Eggleson, who’s about to begin his fifth year in the classroom, treasures the opportunity to bounce ideas off cohorts from other schools, take their advice and perhaps pass it on. Such opportunities are not as common for teachers in the arts.